In support of “I Love Philippines, Byahe Na!” domestic travel advocacy campaign of the Department of Tourism (DOT), the Provincial Government of Aurora through the Provincial Tourism Office is participating in the forthcoming Best of Central Luzon Showcase on October 1-15, 2005 at SM City Marilao, Bulacan. The Best of Central Luzon Showcase is a 2-week tourism and trade promotion activity to be participated in by the 7 procinces of Central Luzon (Aurora, Bataan, Bulacan, Nueva Ecija, Pampanga, Tarlac, Zambales,), Subic Bay Metropolitan Authority (SBMA) and Clark Development Corporation (CDC). It is highlighted by a regional travel mart, trade fair, food festival, and the Araw ng Lalawigan, where each participating province is given the chance to showcase its cultural offerings. The Araw ng Aurora is scheduled on October 2, 2005 10:00 AM – 7:00 PM at the SM City ePlaza Marilao, Bulacan. There will be a special cultural presentation hosted by the province. Don’t miss this event if you’re somewhere near SM City Marilao on October 2. Marilao, Bulacan is just 30 minutes away from Manila. There are FX vans at SM City North Edsa going to Marilao. I will be going with the 400 plus delegates from Aurora. I will not perform on stage, i’ll just take pictures. I saw the rehearsals of the presentations and it’s better than any fiesta production in Baler. The Provincial Government is really bent on making this presentation a special one. There will be performances of the best street dancing kids in Aurora, a Comedia de Baler, the Pangkat Kawayan, a dramatization of the Siege of Baler with John Arcilla, Fashion Show, Folk Dances and lots of other performances. See you there! President Manuel L. Quezon beleived in the worth and significance of the common man. This belief is at the heart of his campaign for social justice which he championed throughout his presidency. President Quezon sought to achieve social justice by protecting the rights of laborers through legislation and personal projects, and by creating more jobs for the common man. He believed that work is the measure of a man therefore man must be allowed to improve his lot and the government must help him. He empowered the disenfranchised: women were given the right to vote, tenants a chance to own land, laborers protection from ill working conditions. He put in place an effective educational system and provided the poor with knowledge and skills to better themselves. He strove to protect our country from dangerous class wars, a danger that persists to this day. He envisioned a country united despite diferences in social class and creed, and a time when this campaign for social justice would no loger be necessary. He appealed to each Filipino’s moral impulse to protect his fellowman. This exhibit traces one man’s efforts to ensure justice for all and to unite them all under one nation. Let it be a testament. Let it be a lesson to all generations. From the official website of the House of Representatives, this is the info page of our lone Congressman, Juan Edgardo M. Angara. Includes profiles, Committees, and house bills he sponsored and authored. Very informative. Here’s a soundclip of Ferdinand Marcos declaring Martial Law. 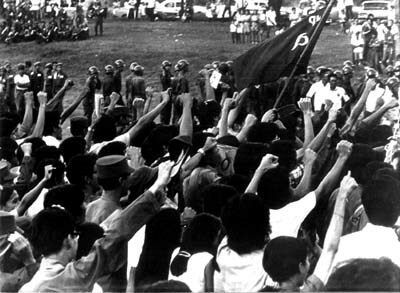 Both picture and audioclip were taken from this ThinkQuest article titled The Philippines Under Martial Law. Proclamation 1081 and Martial Law. from countrystudies. Check this directory about the Philippines. from inq7.net: 2 feared dead in landslide in Aurora town: Government soldiers and volunteers resumed on Tuesday the search for the bodies of two persons believed to have died from a landslide in Dipaculao, Aurora, on Sunday. The Provincial Disaster Coordinating Council (PDCC) in Aurora also mobilized additional earth-moving equipment to sift through the mounds of mud, rocks and logs at Sitio Dinapindingan, Barangay Dinadiawan in Dipaculao, to find Arceli Gallego, 56, and Reynaldo Valenzuela, 45, police reports said. Technorati pointed me to this loads of photos of logging operations in Casiguran. Posted by a certain “casiguranin” from the pioneering Aurora online group casiguran dot com. It was posted more than a year ago and I must have been in Pluto then because I failed to see it. Anyway, better late than later :-). from abs-cbn interactive:abs-cbn interactive: possible landslides and flash floods especially in Aurora and Quezon as the tropical depression is expected to affect these provinces that were badly hit by natural disasters in November and December last year owing to continuous rains. Labuyo, which is expected to affect Metro Manila, would be 130 kilometers north-northeast of Legazpi City Tuesday afternoon and 80 kilometers southwest of Baler, Aurora, by Wednesday afternoon. from The Manila Bulletin Online:3 Aurora towns still isolated by floods and landslides. The northern towns of Dinalungan, Casiguran and Dilasag, this province have been isolated since Friday when some sections of the Baler-Casiguran Road were blocked by landslides triggered by continuous downpour. I was watching the news on TV this morning and Labuyo, the typhoon, was on the headline. They specifically mentioned Aurora and advised us to prepare for this one because the typhoon might cause another round of flash flood. Or a section of the Sierra Madre might collapse ang bury the whole province (my idea). I bet news crews from ABS-CBN and GMA7 are now rushing to Baler to meet Labuyo and to be on location in case mother nature decides to drown us again. We already have electricity since Sunday night. Someone drowned in Maria and another one was covered with landslide in Dipaculao. Update: Wish granted. Thanks to Nympha from Chicago for the iPod Nano gift.